Chloé! Possibly every fashionistas most coveted designer when it comes to care free and easy summer dressing. To make selecting the right items to have a tiny bit easier for you, if you are thinking of investing in Chloé, we have chosen three of our favourite pieces that can be easily incorporated into your wardrobe for the fashionable Chloé look. £390 at Net a Porter Try adding these neutral espadrille platform sandals into your shoedrobe. The classic style and neutral colour with the slight edge of a platform, ensures longevity as they will likely be as good as this season, next season! The colour will go with many outfits, and the scalloped edging is just another cute, feminine detail! 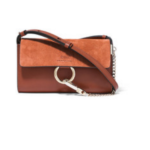 £525 at Net a Porter Chloé handbags are probably at the top of everyones hit list right now. They have brought out many classics that have become the bags of the moment. But we love this small Faye bag, in a dark tan colour. Perfect for day time and evening this summer. 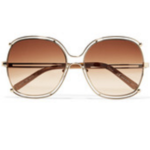 £235 at Net a Porter Retro, boho sunglasses are all the rage right now, and Chloé are possibly leading the game. Think how Dior took last summers sunglasses award with their So Real design, well we think chloe will take this years sunglasses of the year! These square frames with added detail to the frames are stunning, and will look fab worn with loose beachy waves on your next beach vacay!